Statistics show that unfortunately the number of patients waiting for an Organ Transplant is more than the number of organs available. This is the reason that worldwide, there are many organizations and medical professionals, who are very enthusiastically promoting and pushing so that more and more people come forward and be a part of it. India has been doing a highly commendable job in this matter as there are thousands of cases, where patients have undergone a transplant successfully and are enjoying a renewed lease of life. There are highly established hospitals in India, where Organ Transplant procedures are regularly being performed with very laudable success rates. And the list goes in because India is home to several such hospitals and these hospitals are gifting the patients with a fresh chance of living a better and improved life. What makes these hospitals the ‘Mecca’ of Organ Transplant are the supremely qualified and experience surgeons, who have several successful transplant procedures to their credit. Most of these surgeons are proud recipients of prestigious awards for the pioneering level of work that they have done in this field. Not only this, there are surgeons like Dr. Mohamed Rela, who is internationally reputed for being the master in Liver Transplantation and also has his name in the Guinness Book of World Records for performing a successful transplant on a five-days old baby. Similarly, there are many such transplant specialists that India is blessed with, who are making the lives of many patients enormously easier with their knowledge and talent. Organ Transplant is generally needed by patients who are suffering from ailments that have damaged a particular organ beyond repair or cannot be addressed by any other form of treatment or surgery. Some of the medical conditions that can lead to serious amount of organ failure can be heart diseases, Diabetes, Hepatitis, Cystic Fibrosis, Cirrhosis, extremely traumatic injuries or even birth defects can cause organ failure. An Organ Transplant procedure can be called the last ray of hope for such patients. Another attribute that is enhancing and boosting the popularity of India in the matter of Organ Transplant is the cost effectiveness. Even such advanced procedure like Organ Transplant is priced vey economically here. For example, the cost of Liver Transplant in India is 10,000, while the same in USA and UK is 56,210 and 65,000 respectively. Also, Kidney Transplant costs 12,000 in India whereas in USA and UK it is priced at 62,000 and 70,000 respectively. 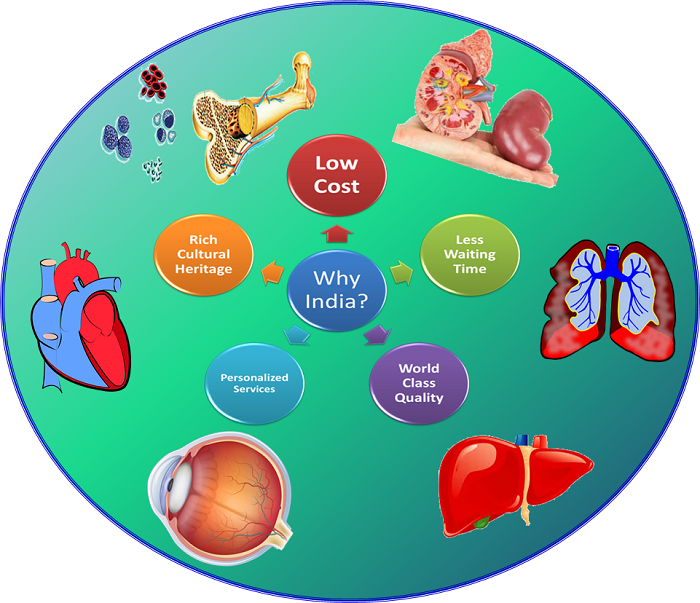 When in India, why choose India Organ Transplant? With each passing year, India is welcoming several international patients needing Organ Transplant. The presence of a leading entity like India Organ Transplant Consultants is definitely boosting the number of incoming patients. This organization welcomes its patients with the best possible services associated required by the medical tourists coming to India for Organ Transplant procedures. We, at India Organ Transplant have staff members, who are putting round the clock efforts to make the international patients feel at home during the whole treatment process. Apart from these, there are many there facilities for our patients, which are customized and updated as per the convenience of our patients. India Organ Transplant is ensuring that the much recognized position of India as a healthcare tourism destination stays intact and more and more patients availing Organ Transplant go back with smiles on their faces.